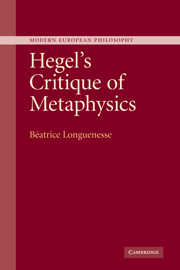 This series publishes a range of high-quality books on philosophers, topics, and schools of thought prominent in the Kantian and post-Kantian European tradition. The series is non-sectarian in approach and methodology, and includes both introductory and more specialised treatments of these thinkers and topics. Authors are encouraged to interpret the boundaries of the modern European tradition in a broad way and to engage with it in primarily philosophical rather than historical terms. Simone Weil: "The Just Balance"